I came across a lovely little hoard of traditional Aztec poems, prayers, and songs the other night. These were originally recored in Ruiz de Alarcon’s 1629 work, Tratado de las supersticiones y costumbres gentílicas que oy viven entre los indios naturales desta Nueva Espana, commonly referred to as “Treatise on Heathen Superstitions” for short in English. For example, he’s posted prayers for safe travel, for love, and even a myth in song about Xochiquetzal and the Scorpion. Professor Joseph J. Fries of Pacific Lutheran University is the person who has generously posted these precious literary treasures, and he includes a bit of commentary as well. Thank you, Dr. Fries! Click HERE to read some Aztec poems! Traditionally, a prayer like this was offered right at sunrise, as the Sun, Tonatiuh (literally, “He Goes Forth Shining”), climbed into the sky. It was a daily duty of the priests, and they accompanied their prayer with the beheading of quail, burning copal incense, and possibly autosacrifical bloodletting as well. While the daily offering of quail was generally reserved for the priests and not the general populace, prayer, incense, and autosacrifice were things accessible to all. The basic structure is simple, and some of its features appear in the longer, more elaborate festival prayers. It has an invocation and a recitation of the god’s name(s), and parallel repetition of phrases. The repetition is a common feature of what was called “lordly speech” in Imperial times, and was a formal style of rhetoric used by nobles and by people addressing the aristocracy. As the Teteo are depicted as the nobility over humans, the same type of formal language is used in prayers addressing them, as all humans would be commoners or macehuales to Them. These techniques combine to show the respect the worshipper has for the gods. The second half of the prayer consists of contemplation of the future, including the realization that our world is an uncertain, unstable place, and our fortunes could reverse at any time. I wouldn’t be surprised in this context if it is not only a statement of the fragility of mankind, but a subtle plea to Tonatiuh to not be slack in His duties of warming and lighting Tlalticpac (Earth’s Surface). Finally, the prayer closes with a double exhortation to the Teotl to shine with vigor upon the world, the petitioner literally cheering the god on. 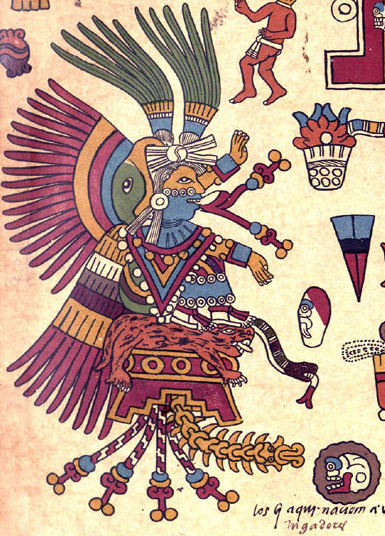 If you wish to become more familiar with how the Aztecs composed their prayers and hymns, I recommend visiting my Hymns & Prayers section on the Sacred Texts section of this blog.